Hey everybody! 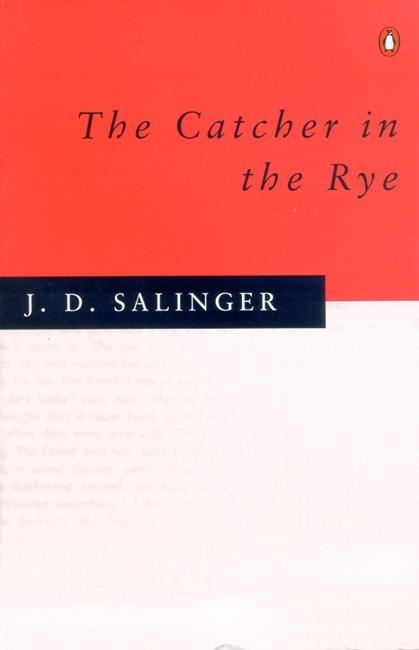 I’ve just recently finished The Catcher in the Rye by J.D Salinger and thought I’d tell you my thoughts on it. So, without further ado, let’s go! Normally I’ll start my reviews with a few comments about the cover of the book. However, I don’t really have much to say because my edition of the book was pretty simple and plain. I think I liked it though because it definitely made me feel like I was reading a classic, and that made me feel smart…. Anyway, enough about my intelligence, let’s talk about the characters. The main character, Holden, is definitely a rebellious little creature who seems to have a weird dislike for all adults. He calls everyone a phony and is constantly going on about how much he hates them. However, he seems to contradict himself over the whole phony issue because he goes around pretending to be someone he’s not (I can’t say much more or I’ll spoil it for you). I think Holden is a very relatable character to most teenagers and that’s why I think this book is so well loved. Unfortunately, I couldn’t relate that well to Holden- probably because I’m a goody-goody, yeah, sad. Despite this, I did find that some moments in the book made me laugh out loud, the many friends that Holden encounters really adds to the humorous side. Now let’s talk about the writing style. For me, I found the writing style a little bit annoying at times.. Don’t hate me… Yeah, I just didn’t like all the repetition. Words like, ‘goddam’ and ‘phony’ and ‘depressed’ were repeated at least 6 times a page. Also, a lot of points would be made in the book and then they’d be rephrased all the time. That just got on my nerves. The beginning and end of the book also seemed a bit too abrupt for me and I didn’t think the book was fast-paced enough for me. I do feel bad for not liking a classic too much, when I told people I was reading this I got loads of messages like ‘that’s my favourite book!’ and ‘you’ll love it!’, so I went into this book with really high expectations… And it didn’t turn out to be what I expected. Don’t get me wrong, everybody loves this book so you should definitely give it a go! Thank you guys so much for reading this! Please comment down below telling me any books you’d like me to review or letting me know your views on The Catcher in the Rye, I’d love to know. Please like, subscribe and check out all my social media links down below. Speak to you soon! Bye! I Just Found A New Read-A-Thon!!! Hey y’all! Quick update here! I just wanted to tell you guys all about this read-a-thon that is starting in 3 hours…. Yeah sorry about short notice but I only just found out! Yes, about the #AYearAThon read-a-thon…. Since this new read-a-thon starts tomorrow I thought I’d cut the #AYearAThon short… So I’ll wrap up now!!! I also managed to almost finish ‘New Moon’ by Stephenie Meyer- if I continue tonight I will get it finished! I would’ve definitely been on track to start ‘Eclipse’ by Stephenie Meyer so I’m proud of that! So… In total, during the read-a-thon I read 727 pages! Now I know a lot of you guys have probably read so much more than me but school has been getting in the way and yeah… Sorry….. The read-a-thon I will be participating in is called Readorama!! Sounds great right?! I know! This read-a-thon includes loads of challenges and reading sprints and stuff so it should be super fun!! The Readorama read-a-thon is taking place from the 8th to the 14th of March, midnight to midnight! So, during the read-a-thon there are loads of different challenges and here they are!!! 1. Read a book for your TBR Jar or read a book which someone picks for you. For this I am reading Grimm Tales by Philip Pullman. My dad picked this one out for me. 2. Read a book with green on the cover. For this challenge I am reading We Were Liars by E.Lockhart. 3. Finish a series (duologies included). For this I am going to be reading or at least starting Cress by Marissa Meyer. 4. Read a contemporary novel. I have chosen The Catcher in the Rye by J.D Salinger for this one. (I think it’s contemporary). 5. Read a book that is considered diverse/ different from you. I have chosen Every Day by David Levithan for this one. I’m not a boy and I don’t wake up everyday in a different body… So that’s different! 6. Read a book with flowers on the cover. For this I have picked All the Bright Places by Jennifer Niven. Yay I can’t wait to have my heart ripped out!! 7. Read a book where the letters ‘R-A-M-A’ appear on the title or/and the author’s name. For this I chose Vampire Academy by Richelle Mead. There’s an R in Richelle, an A in vampire, an M in academy and an A in Mead. 8. Read at least 7 books. I’m sorry again about cutting the other one short but I think this read-a-thon will be super fun! Please comment down below your TBR and whether or not you will be participating! Please subscribe, all my social media links are down below and I will see you guys really really soon!! Author yourbestbookpalPosted on March 7, 2015 March 11, 2015 Categories Read-A-ThonsLeave a comment on I Just Found A New Read-A-Thon!!! -New Moon by Stephenie Meyer, this has been sat on my shelf for about a year now… I’ve already red Twilight but none of the others. – I also want to start ‘Eclipse’ by Stephenie Meyer. This has also been on my shelf for about a year- I need to complete this series!! What is your TBR for this read-a-thon? I’d love to know! Thank you guys so much for reading, all my social media links are down below, feel free to use them. I will see you really soon with my #AYearAThon Wrap Up! I will be updating my progress mainly on Instagram if you want to follow me on that! February Book Haul and Wrap Up! Hey everyone! I realised I completely forgot to post my book haul yesterday and so that is why I have combined my book haul and wrap up into one post so you aren’t overwhelmed! Anyway let’s start out with the wrap up! Last month I managed to read 6 books, now I know that doesn’t sound like much but I think I got into a huge reading slump when I got back to school and I actually found myself putting a book down this month which I definitely don’t do often. Don’t get me wrong the story was amazing, I just think I wasn’t in the right mind set for it what with all the stress from school and stuff. Anyway, let me tell you about all the books I read last month! Firstly, I read ‘Amy and Roger’s Epic Detour’ by Morgan Matson. I don’t really tend to read many contemporary books but this one makes an exception. This story is about a girl called Amy who’s dad has just died in a tragic way and Amy’s mum wants to pack up and move all the way to the other side of America. Amy is going to drive the car down later after she’s finished her exams but she doesn’t want to drive so she enlists the help of an old family friend Roger to drive. The story is so funny and witty and cute and relatable and all those good things. The characters are so detailed and hilarious so the story flows along with them so well. Not only are there words in this book but there are receipts, photographs and playlists in here which make the book so much more interesting. It’s like a little scrapbook, it’s so cute! I loved this book so much and I gave it a 5 out of 5 stars! Amazing! Next up, I read ‘The Hallowed Ones’ and ‘ The Outside’ by Laura Bickle. on her every word. I gasped out loud so many times while reading this book as it surprised me so much (or I’m just really thick). I also gave this book a 5 out of 5 stars. Absolutely fantastic! And next I read… ‘Never Let Me Go’ by Kazuo Ishiguro. I’m not going to explain this story too much because the enjoyment is in the not knowing and the shocks of the dark truths. I had to read this book for school but I actually enjoyed it more than I thought I would. This book is a dark dystopian all about these woman looking back on her days at Hailsham School and discovering the fragility of life. This book made me think about things I never thought of before and hit me really hard with the emotional side of it. The only thing I had a problem with was the jumping between time periods but once you got half way through you forgot about all that. I gave this book a 4 out of 5 stars. So good! There are no words to describe how amazing this series is. This series is all about a girl called Cinder and she is a cyborg… I know awesome right? There is nothing else I need to add to that other than it’s all about her trying to live under her stepmother Adri and stepsisters and the plague. Some people say that this book is predictable but I really really enjoyed it and Prince Kai…. If you read this book let me know because I would love to fangirl over Prince Kai with you… I love him… Anyway, I love how the series grows with each book. In Scarlet we meet Scarlet (duh?) who is very similar to Little Red Riding Hood. All of the characters stay throughout the books and so a whole world is created and it’s just amazing! I think I like Cinder a little bit more than Scarlet but that’s just me. I loved these books so much and I gave them both a 5 out of 5 stars. Now onto my book haul. I bought 15 books last month. The Shatter Me trilogy by Tahareh Mafi- Shatter Me, Unravel Me and Ignite Me. The Iron Trial by Holly Black & Cassandra Clare. The Infernal Devices trilogy by Cassandra Clare- Clockwork Angel, Clockwork Prince and Clockwork Princess. Deep Blue, book one in The Waterfire Saga by Jennifer Donnely. The bind up of the first three books in the Sweep series by Cate Tiernan- Book of Shadows, The Coven and Bloodwitch. Scarlet and Cress by Marissa Meyer. Thank you guys so much for reading. I’m sorry again that I didn’t read that much last month. How was your reading month? Do you have any new books you’d like to tell me about? I’ll be posting again super soon so keep an eye out. All my social media links are down below, please feel free to use them. Author yourbestbookpalPosted on March 1, 2015 March 11, 2015 Categories Book Hauls, Wrap Ups!4 Comments on February Book Haul and Wrap Up!